Accidently killed a shared datasource for 1000 reports. Found a handy query to update all those reports with a re-created datasource. Updated a couple of reports manually in Sharepoint. Ran the following against the ReportServer database. You are looking for the D.LINK response. This is your GUID for the second query below. This will get you all the reports you borked. And now update the ReportServer database. Had a request to create a report for Project Server milestones. 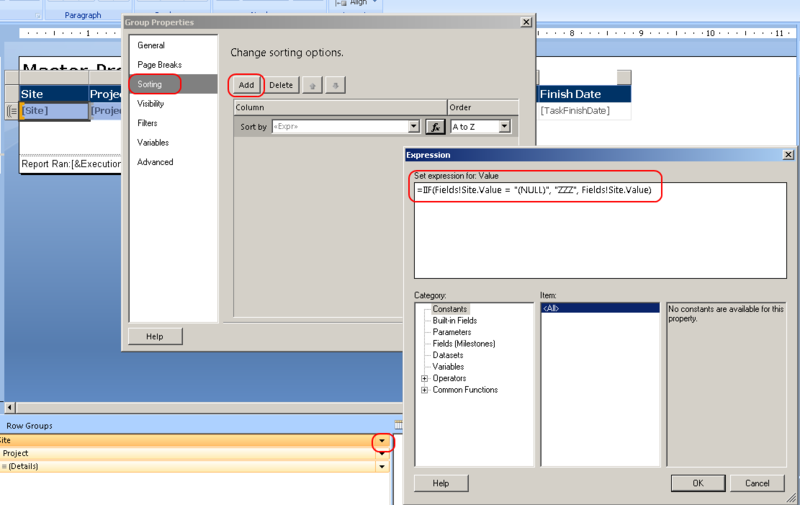 There was a custom enterprise column added for tasks which contained a location code. My report had to return all values including where location was NULL. The first step was to get a valid NULL parameter in my Site parameter drop-down menu. — Here’s where we add NULL for the menu. Second step was to create the dataset query to accept all values including NULLs. I then added a Filter on this dataset for the @Site parameter. Third: There was a requirement that when sorting the table, Sites with NULL values should be LAST in the list. The dataset query works in SQL Management Studio, however, not so much in SSRS. I had to put an expression in the Row group sorting field.